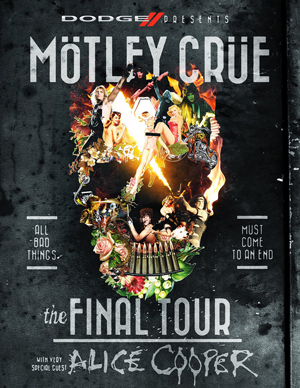 MOTLEY CRUE have announced the details of their final addition of North American dates. The select new shows will take place in October and December as part of the band’s two year Final Tour cycle. Their touring career will conclude on New Year’s Eve, December 31st at Staples Center in their hometown of Los Angeles where the band’s career began 34 years ago. The band’s exclusive VIP Packages (including opportunities to meet band members, new exclusive merchandise, up-close and personal view of the encore performance like never before in the CrüesNest, and more) and Fan Club pre-sales for these dates start April 22nd. Check out VIP offers HERE. To join the Fan Club go HERE. Local ticket pre-sales start this Thursday, April 23rd at 10 AM, local time before the public on-sale begins on Friday April 24th at 10 AM, local time with some dates going on sale on Saturday, April 25th. See below for a full list of dates.